After an exciting long day at Brooklyn Boulders, the Access Fund/Black Diamond ROCK Project Tour headed up to where the real rock is, The Gunks! A busload of sleepy climbers recovering from Saturday night’s ROCK Project party in Brooklyn climbed into a bus at 6:45am and headed north to New Paltz. 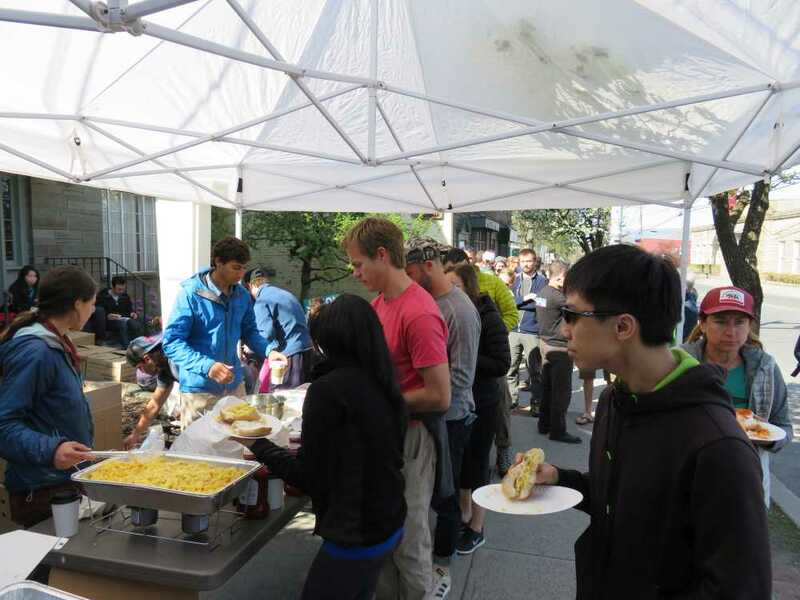 They were greeted by a sidewalk egg breakfast hosted by the venerable Gunks climbing shop, Rock and Snow. The tall guy in the red shirt is Brady Robinson, Executive Director of the Access Fund. 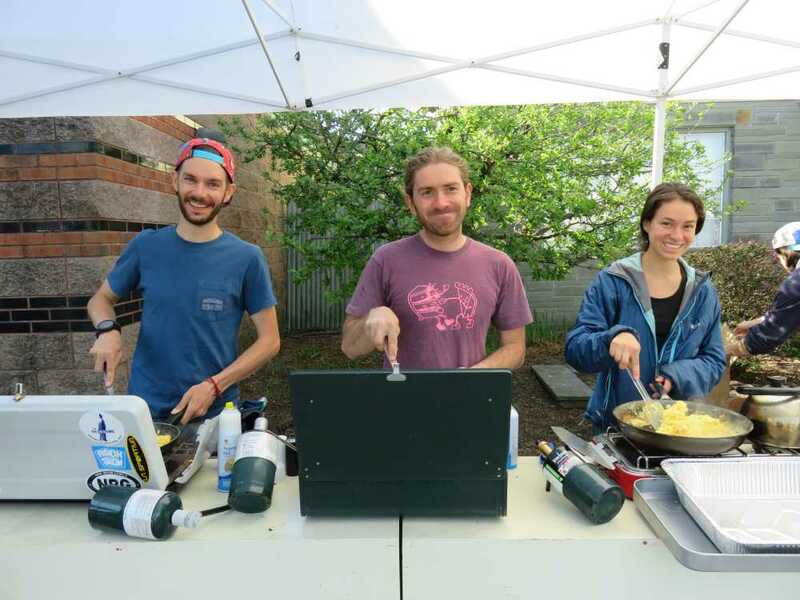 GCC peeps Tim Keenan and Andy Salo, along with Gabby O’Shea – cooking up lots and lots of scrambled eggs. 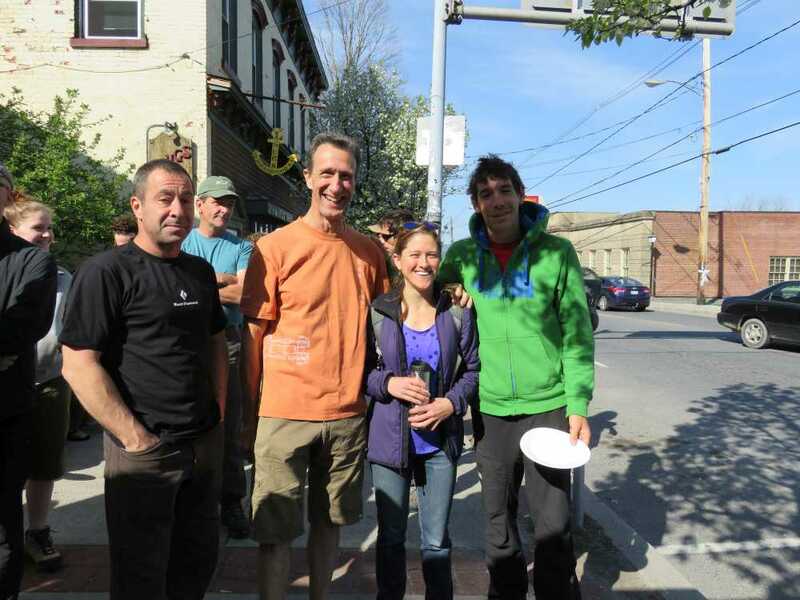 Al Diamond, Russ Clune, Whitney Boland and Alex Honnold – that’s one serious collection of talented climbers in one place! After breakfast we gathered across the street to get organized for the day’s Land Stewardship Project. 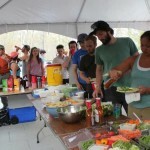 New Paltz Climbing Co-Op founder, Chad Foti coordinated the massive volunteer event. Mohonk Preserve day passes were distributed and groups were formed. 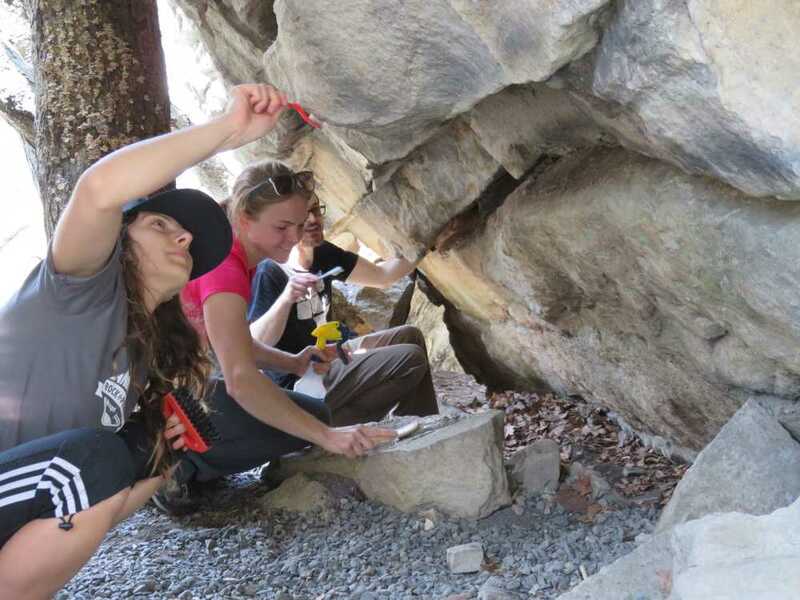 Then everyone headed up to the Gunks for the project – helping to scrub years of accumulated chalk on the Gunks’ famous boulder problems. 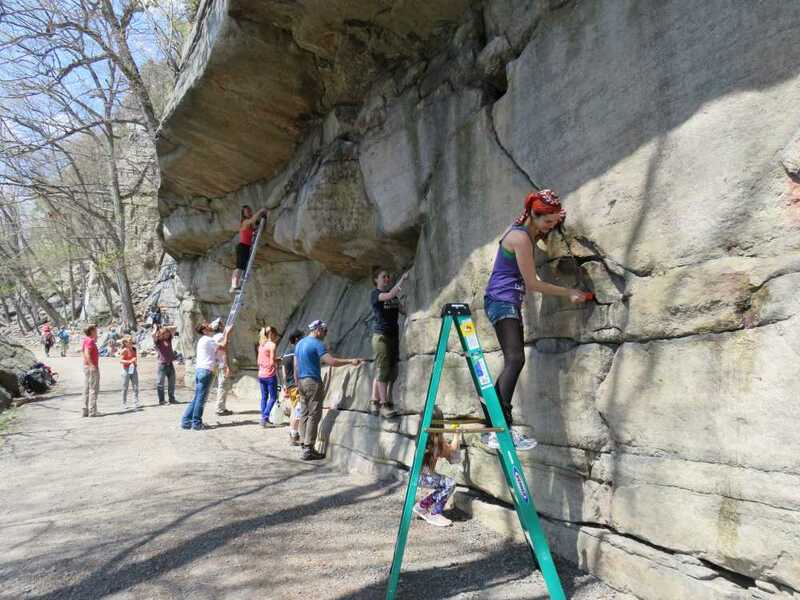 With a group this large, a chalk cleaning project was the easiest to coordinate, and provided a great way to showcase land stewardship in action to everyone else at the Gunks that day. John Ross, long time Gunks climber, guide and now Mohonk Preserve ranger, explains the day’s activity. 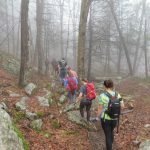 The volunteers were divided up into multiple groups, each one with a group leader who could explain the process, and one of the professional climbers. Various bouldering areas were stocked with ladders, water blasters called indian tanks, and brushes. In order not to blast the chalk deeper into cracks, the process was to brush off, blow out, brush again, blow out, then use the water to clean off remaining chalk and brush again if necessary. Volunteer groups were spread out from the Behemoth Boulder all the way down to the Andrew Boulder. The mood was cheerful and everyone helped. 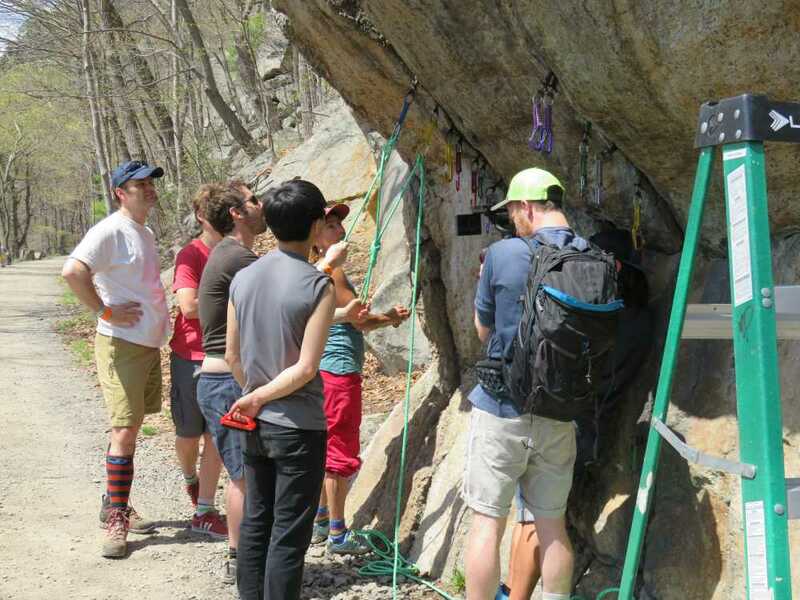 Afterwards, there was plenty of time to get in some climbing before the Gunks Climbers’ Coalition BBQ. Yes, that’s one of the best women boulderers on the planet, Angie Payne, scrubbing chalk off of the Behemoth Boulder. Using some muscle to clean the Egg. We weren’t quite sure what pro climber Brittany Griffith was up to, but they were filming her. 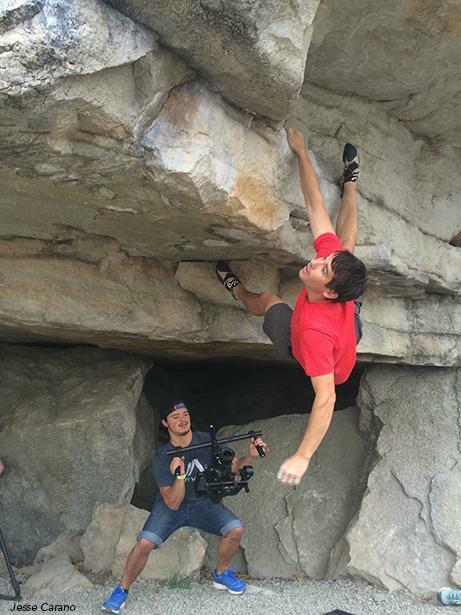 Alex Honnold gets in some bouldering, cameras following him everywhere. 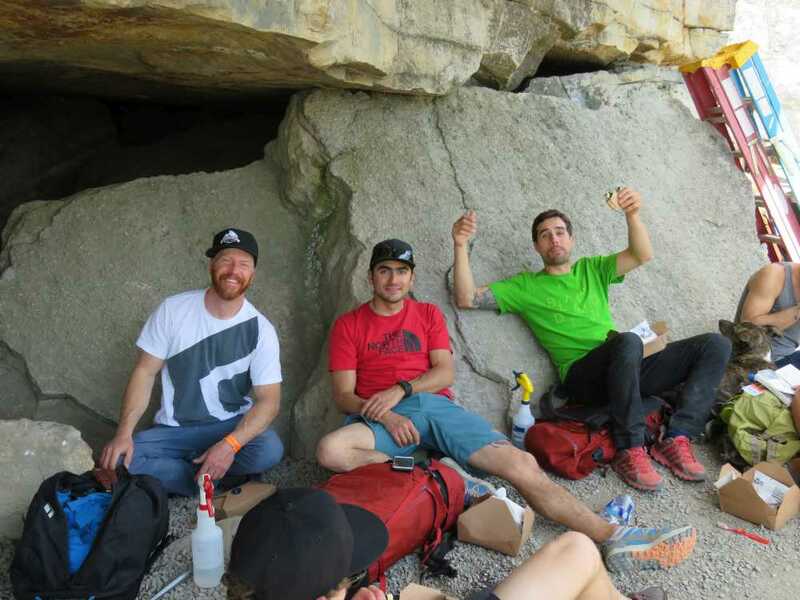 Pro climbers Chris Schulte, Sam Elias and Joe Kinder relax for lunch. 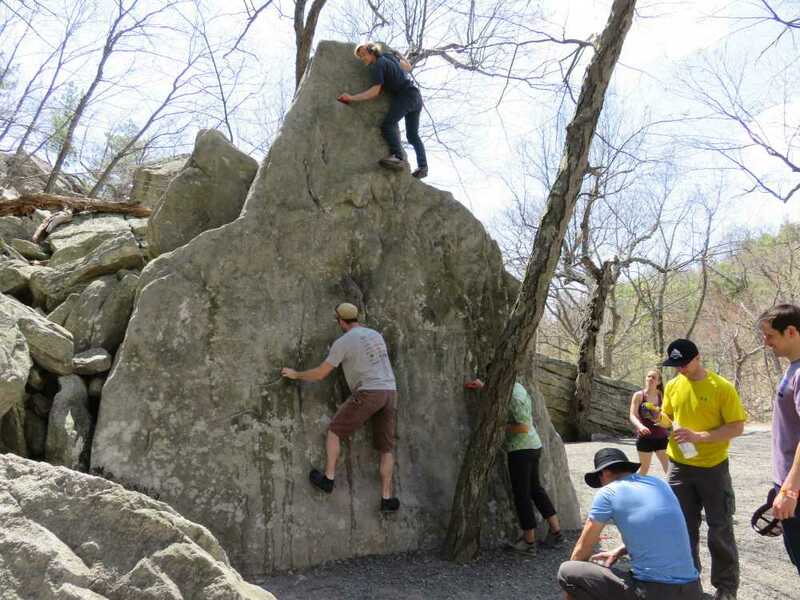 After some free time to climb, the entire ROCK Project tour headed over to the Mohonk Preserve Visitor’s Center to join the other Gunks climbers for the Gunks Climbers’ Coalition Members-Only BBQ party. 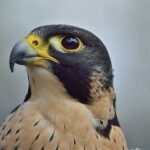 Stay tuned for another blog post with photos of that event.